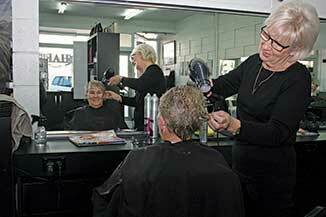 “Hairdressing hasn’t changed, just the techniques and names” said Lesley Smith as she prepares leave her vocation after 52 years of cutting and styling hair. “I’ve loved every minute of it” she said. “It’s not retirement but a change in lifestyle” as she prepares to move to Longburn to help care for her grandchildren. Lesley began her career when she was 15, starting her five year — 5000 hour apprenticeship in the Salon Parisienne in Lower Hutt, before moving to the new exclusive salon in Kirkcaldie and Stains in Wellington a year later. After that she enrolled as a foundation student at the new hairdressing course, at the then Wellington Technical College. Over the years, she has kept in contact with one of those 10 students, Donna Platt. Donna was at Lesley’s farewell function held at Chairs Hair Design along with friends and clients from over the years. 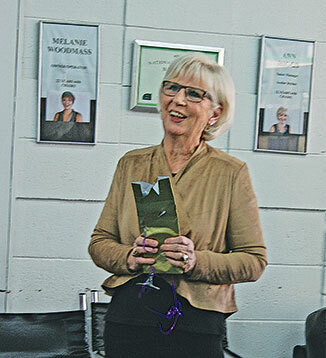 Some of those clients who have followed Lesley as she moved to Paraparaumu and then to Otaki over the last 30–40 years, were also there to farewell Lesley. Donna related some of the “things” the friends got up over the years, “we had fun and laughs with Lesley and we’ve been away together. We’ve enjoyed our time with you, Lesley,” Donna said. During her 14 years at Kirks she entered a lot of competitions, where she was very successful. A highlight of those years came when international singing star, Cilla Black performed in Wellington. Lesley had the task of blow waving the singer’s hair. Over the latter six years she worked part time while her mum looked after her young sons. Lesley moved to Paraparaumu with her husband and two sons where she set up her own business, Salon Capri which she owned for six years. The family then moved to Otaki “that’s when I retired to be with the boys” but she missed the salon so much she started doing some work from home. Then followed a few years working with Richard Hakkens at Just Haircraft, next was New Image and then opening The Strand hair salon with Julie Law. After they sold that, she spent some time with Essensu, but wasn’t ready to give it all away when that closed, so she rang Melanie Woodmass and has been at Chairs over the last eight years. But now it’s time for a change, her house has sold and she’s off to son Kane’s to help with her grandchildren. “I’m going to enjoy them while I can. I’m looking forward to taking them to ballet and my grandson to soccer. It’ll be so different,” she said. “And I’m going to make a vege garden, I’ve never had one!